Russell Davies has come up trumps again with a fab idea for a kind of user generated festival conference thingy for Planning types in London on 16th June 2007. The plan is to have all sorts of speakers speak about all sorts of stuff. Not brands, advertising, blogging and twitter but interesting, unexpected, original things. I’m hoping to find fascinating people and to just ask them to speak about something they care about. I want to replicate the experience of clicking from one really good blog to another, ranging across sciences, arts, musics, jokes and whatever. There will be 20 minute slots and 3 minute slots. Some people will play music or sing. And some people who can’t be there will be asked to send three minute videos. Perhaps. 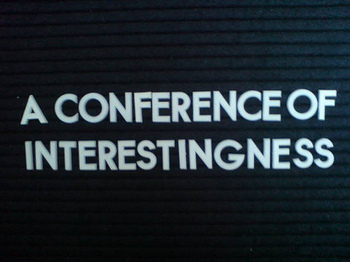 I reckon we can squeeze a lot of interestingness into a day. And then have a party afterwards. Sounds good doesn’t it! There seems to be a bit of alight anti Russell knocking happening at the moment, but I think that he has seem a void and stepped in and tried to do something different and useful. Do you think that you guys will be going? I think Andrew is going also.